In December 2013, Pro Se Productions debuted its Single Shot line of digital singles. Amongst the first in that line was a story by noted New Pulp Author Jim Beard. The tale centered on the terror brought to a city by a villain who in fact was already dead. The story acts as a prelude to an upcoming Single Shot Signature Series by Beard. In order to avoid confusion with properties not related to said character and to make this rather original tale more unique, the author and Pro Se Productions made a decision to rebrand the story, changing the name of the central character. In doing this, Beard found new inspiration and brings a new fire and energy as well as new storytelling angles to not only the future work, but also the already published prelude. Pro Se Productions proudly reintroduces readers to a work by Author Jim Beard featuring a character, familiar from the first incarnation, but also different in many ways. 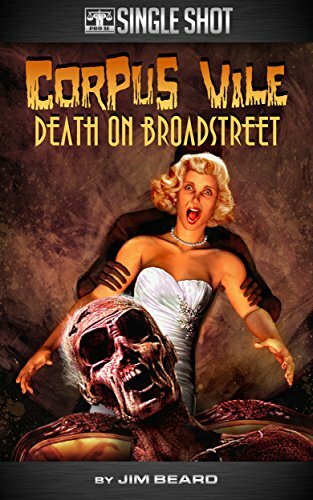 Corpus Vile: Death on Broadstreet by Jim Beard is the (re) introduction of a new, horrifying character in the world of New Pulp. A disillusioned lame duck District Attorney, a blind adventurer turned mayor, and indeed an entire city find themselves trapped in the grip of walking Death. A mysterious figure known as Corpus Vile takes life from bodies and brings back those he wishes to worship him! Find out what terror awaits all in Corpus Vile: Death on Broadstreet by Jim Beard. Also, in October, Jim Beard’s Corpus Vile: Death in the City will debut as a Pro Se Single Shot Signature series, picking up where Death on Broadstreet ends. Featuring a fantastic cover and logo design by Jeffrey Hayes and eBook formatting by Percival Constantine, this Pro Se Single Shot is available on Amazon, Barnes and Noble, and www.smashwords.com for only 99 cents.